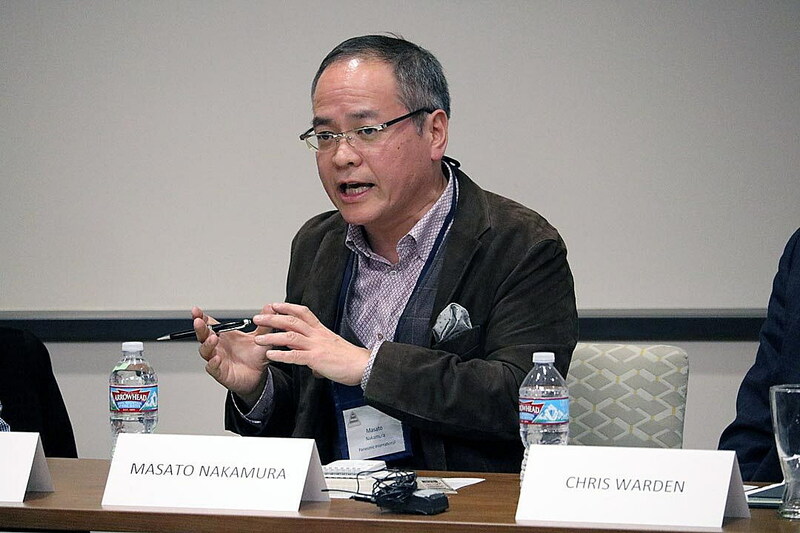 Masato Nakamura, the director and general manager of international corporate affairs for Panasonic, discusses cyber security during a roundtable discussion at the University of Montana. This is the second of three stories on how information technology and innovation are transforming industries and people’s lives. The topics were discussed during a roundtable reception with the leaders of IBM, Panasonic and the Washington Corp. at the University of Montana. If hackers successfully stole credit card data from Target, breached the Internal Revenue Service and hacked the Democratic National Committee, then chances are good the attacks will increase as the world becomes more connected and dependent on technology. Alex Philp, a Mansfield senior research fellow at the University of Montana, posed the question of cybersecurity to three technology experts in a roundtable discussion this week. All three agreed that the threats are real, though one suggested the risks are often created by sloppy business practices. According to industry experts, 169 million personal records were exposed in 2015 resulting from 781 publicized breaches across a number of sectors, including financial, health care and government. That marked a 38 percent increase over 2014. Cybersecurity Ventures also suggests that damage from cybercrime will hit $6 trillion annually by 2021. In 2013, UM opened its Cyber Innovation Lab to train students on tracking and defending cyber technology. The increase in cyber attacks has pushed security spending on products and services to more than $80 billion in 2016. Spending on security is likely to surpass $1 trillion by 2021. The figures, profits and sales associated with cybersecurity isn’t lost on Chris Warden, vice president of technology at the Washington Corp. Even so, Warden said cyber attacks are one of the biggest threats facing his company, which includes Montana Rail Link. The railroad uses sensor technology and streaming data to run its trains more efficiently. The railroad serves more than 100 stations in Montana, Idaho and Washington, and is responsible for shipping many goods out of state to distant markets. The New York Times has reported that Russian hackers roamed freely through the Democratic National Committee’s network for almost seven months before the committee was aware of it. Masato Nakamura, the director of international corporate affairs with Panasonic, said his company is taking steps to keep hackers from infiltrating its line of products, most of which are increasingly connected to the network.